"I took a master class with Billy Wilder once and he said that in the first act of a story you put your character up in a tree and the second act you set the tree on fire and then in the third you get him down." 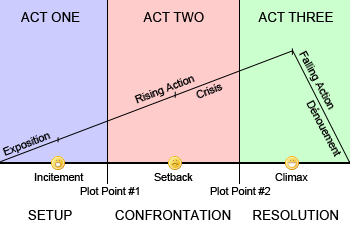 The Three-Act Structure is a typical and frequently-used narrative structuring template. Most of the mainstream movies released by Hollywood conform to this template, but it can be found in other story-telling forms as well. The idea is that the story is structured so that all of the action falls into one of three acts, with regular plot-points (or reversals) used to bridge each act, and send the narrative into a different direction than it had previously been going. The First Act is the Setup. Generally speaking, it lasts the first quarter of the story (the first half-hour for a typical two hour movie), and is where the main characters are introduced and the dramatic premise (i.e. what the story's about) and the dramatic situation (i.e. the setting and context in which the story's taking place) are established. At some point in the First Act (usually half-way, but not always) the Call to Adventure (or in more mundane settings, an Inciting Incident) occurs to set the plot of the film in motion. Whether the protagonist accepts it or not, it doesn't matter; events are set in motion causing the protagonist to follow the path of the narrative, whether they want to or not. Occasionally, "Point of Attack" is included as a separate concept to the Inciting Incident — the Point of Attack sets the plot in motion, and is often outside the protagonist's control; the Inciting Incident is when the conflict is thrust upon the protagonist, forcing them into action and setting up the motivation for the main character. Related to the first act is a general screenwriting rule of thumb which states that the protagonist, the central supporting characters, and the scenario must all be introduced and clearly established within the first ten minutes of the movie in order to hook the audience's interest — any longer, and you risk losing them. Novel writing generally follows the same rule, replacing the first ten minutes with the first fifty pages. The Second Act, the Confrontation, is the longest, generally twice as long as the other two acts, or the second and third half-hours in a two hour movie. In this act, the main character(s) meet their Mentors, Love Interests are established, and, most especially, the protagonists will encounter obstacles in the form of people, objects, and settings that appear with rising potency and increasing frequency in order to stymie the protagonist. In particular, the presence of the foe will be felt, causing the first clashes between The Protagonist and The Antagonist. At some point during this stage (often halfway), the protagonist will seem to be close to accomplishing the ultimate goal, but events will conspire to prevent success. Expect The Centerpiece Spectacular to unfold. As a result, the protagonist will reach his/her lowest point and will often temporarily give up in despair. The Third Act, the Resolution, is where the story wraps up. The protagonist returns to the fight (even coming Back from the Dead to do so, in some cases) and the struggle will renew. The Climax is where the battle reaches its peak in emotional and physical intensity. The protagonist will either prevail or — if it's that sort of story — fail again, and fail so painfully and completely as to make further continuation of the struggle impossible. After this comes the denouement, where things calm down and an equilibrium similar to the state of affairs at the very beginning is restored. However, having experienced the events of the story, the characters have hopefully grown and evolved beyond what they were at the beginning, and often have difficulty re-adjusting to the way things were. If done well, the Three-Act Structure is a useful tool in making interesting stories that develop and progress logically. If done poorly, there's a feeling that what we're experiencing is something we've seen many, many, many, many times before. Bear in mind that the three-act structure comes from Ancient Greek drama, and actually from Aristotle's Poetics who analysed a number of plays as conforming with this structure, and some which did not but which he still saw as good works. This structure was more influential on European drama rather than English drama. For instance, William Shakespeare was famous for his plays not really adhering to it, filled with asides, subplots, and characters and not really putting his characters motivations in such clear lines. In classical Hollywood, the term came in from the sound era where the influx of theatrically trained talent as screenwriters, directors, and producers which also lent the films to be fitted on the more rigid studio system model. Film-makers actually experimented and rebelled against this structure constantly between The 60s and The '80s as noted by film scholar David Bordwell but since The Blockbuster Age of Hollywood, a new intensified version of the three-act structure has become the production norm, and has become widely known and imitated on the internet later on. In the case of television, owing to its serial nature, the three-act structure is modified or streamlined either for season-arcs or in the case of episodes, mini-arcs that was mapped out by Dan Harmon as a kind of miniature circle whereby episodes would start from a stable setting, flirt with some change and problem before returning to the status-quo.